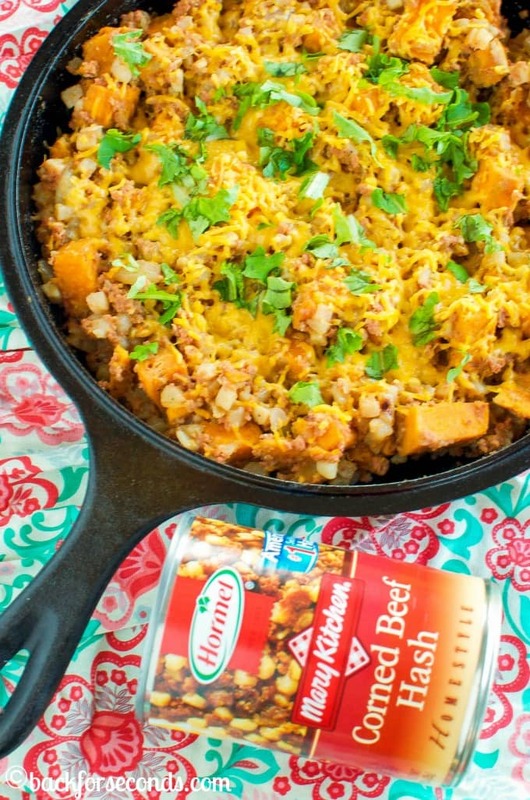 20 Minute Cheesy Sweet Potato Hash is an easy, hearty, budget friendly dinner for busy weeknights! 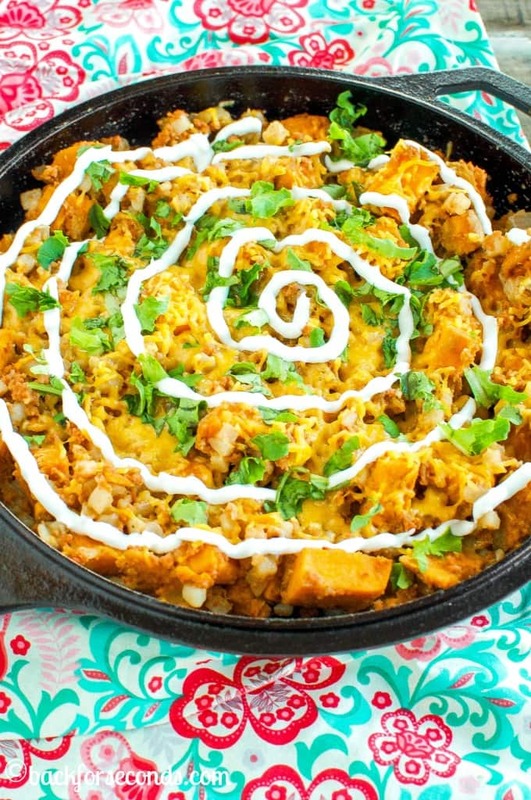 Made in one skillet on the stove for easy clean up too! Raise your hand if you love quick and easy dinner recipes! Raise your hand if you love meals that dirty only one dish! Raise your hand if you agree cheese makes everything better! Ok, I can’t see any of you, but I am going to go ahead and assume y’all are raising your hands up high! Read on, friends, this one’s for you! I love getting creative in the kitchen and I love trying new products. We all know Hormel, but have you ever tried Hormel MARY KITCHEN® Corned Beef Hash? I have the opportunity to create some hearty, easy, budget friendly recipes using this product! Since school is starting up again, many of us are in need of fast, no fuss dinners. Enter today’s recipe! 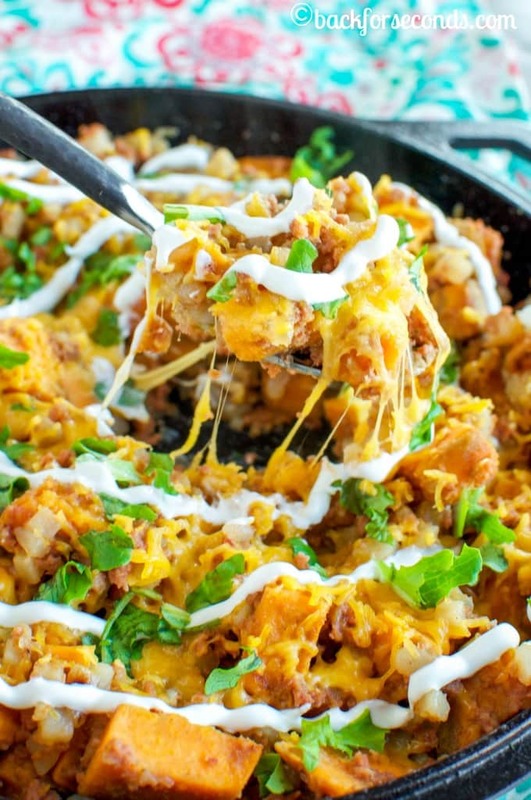 This skillet dinner is so quick to make – 20 minutes from start to finish! I know for myself, with a busy schedule and 5 little ones (and a husband) who are always hungry, meals that can be made in one pot in less than 30 minutes are life savers! Also, I’m not the best meal planner, and half the time I forget to take meat out of the freezer in time to thaw before it’s time to start cooking dinner. That isn’t an issue with this recipe. Yay! I don’t think I would be able to stop eating this. Quick dinners like this are the absolute best! So delicious, too. I wish that I could dig right in with my fork. Those photos have my tummy growling! Might have to make this soon!